After the 4th of July, summer begins to settle. The kids are used to their new routine, which is much like the school routine but without the pressures of grades and homework. Parents have some time off before the big family excursion in August. And it may be time to look for little things to do to fill in the long days. Simple home remodeling projects can certainly do that and provide increased equity as a bonus. And there’s no finer feeling than enjoying the results of some extra effort making your home better after a week or two of domestic disruption. HOW ABOUT STARTING WITH A PAINT JOB? You look up at the roof eaves and the window frames of your home and are saddened by the peeling and cracking. It’s time to do something about it, but it seems so hard to organize it all. Gathering together the paint, the rollers, brushes and various tools. And how much is this all going to cost? Well, rather than going into an intense, personal research study on the ins & outs of painting your house, how about just contacting some painting contractors and getting some bids? Many of these contractors have sophisticated estimating programs incorporated right into their websites, which will give you a pretty good idea what the whole thing’s going to cost, and, most importantly, how long it’s all going to take. So instead of stressing about that old cracking paint, start clicking and get some answers. MAYBE YOU SHOULD REPLACE THE WINDOWS? 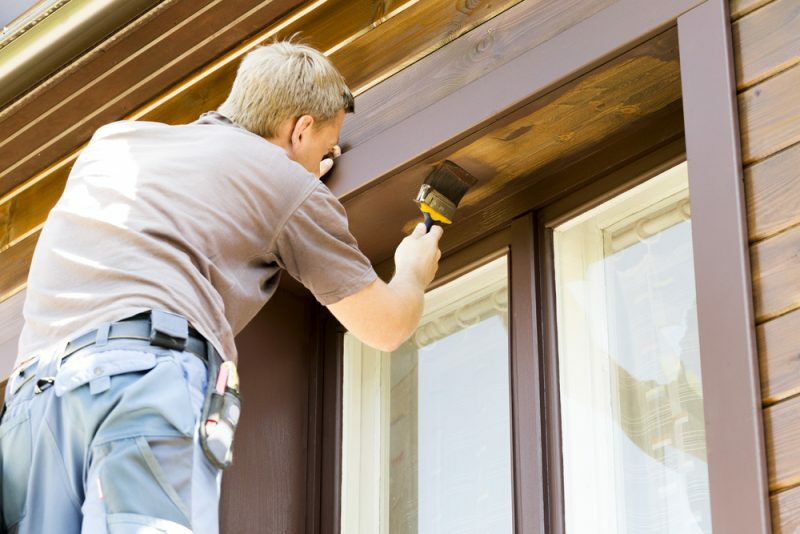 It might not be worth repainting those old, leaky wooden window frames after all. Why not take advantage of the brief disruption the house painting will entail and replace your old single-pane windows with state-of-the-art, double-pane, gas-filled new window frames, at the same time. The savings these new windows offer due to the mitigation of heating and air conditioning costs could pay for this home improvement over the long run, and you have the satisfaction of enjoying the beauty of these new window treatments and their ease of operation. A win-win situation if there ever was one. So if you’ve decided to take advantage of the lesser stress level of summer to disrupt the routine and upgrade the outside of your house, why not remodel the kitchen at the same time? Of course, this is going to increase the budget, but maybe not as much as you think, because wise scheduling choices with your subcontractors could help them share tasks with each other and lower costs. For example, the exterior house painters could do double duty repainting the kitchen, on the same days, if you coordinate between those two suppliers. It just takes a little extra time and thought, working on the big picture of your entire remodel, to schedule these various activities to your best advantage. And you, the homeowner, are the very best person to do that. Also remember that when you’re remodeling your kitchen, purchasing the cheapest appliances and fixtures is not always the most efficient approach to long-term savings. They wear out faster and will need to be replaced more often. Whereas, if you buy the very best plumbing fixtures, they will generally last twice, or even three times, as long as the cheap ones, because they are manufactured from much better materials and to higher standards. The same generally holds true for appliances. The more they cost, the longer they last and the less service maintenance they require. You can also save money on high-end appliances because you don’t necessarily need to purchase the extended warranties that are practically mandatory with the cheaper brands these days. Kitchen counter tops seem to have become the most important design statement in the current trends of culinary remodeling. Durability is, of course, the top criteria to consider for your countertops, followed closely by cost. Granite and marble are the top choices because of their beauty and durability. But they are both very susceptible to staining and must be sealed, intermittently. Corian countertops, made from acrylics and polyester, may not enjoy the high status of their two high class cousins, but they are virtually maintenance free and very easy and inexpensive to repair. Something to think about when you’re considering the long-term utility of your new kitchen. If you want the longevity of Corian and the look of natural stone, you might consider Quartz surfacing (also called engineered quartz or engineered stone), which is made from a combination of resin and quartz chips, tinted with color. Just remember, whatever surface you choose that you are going to live with it for a long, long time.